Action/Drama/History/Gainful, USA, 1960, 208 min. Synopsis The theme is the founding of the state of Israel. 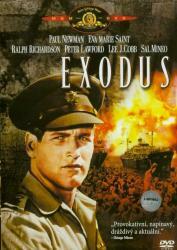 The action begins on a ship filled with Jewish immigrants bound for Israel who are being off loaded on Cyprus. An Intelligence officer succeeds in getting them back on board their ship only to have the harbor blocked by the British with whom they must negotiate. The second part of the film is about the situation in Israel as independence is declared and most of their neighbors attack them.